The Young Marines is a youth education and service program for boys and girls, ages 8-18, that directly deals with issues facing the youth of Tangipahoa Parish. 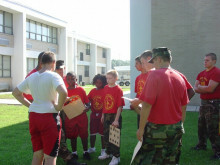 The Young Marines promotes the mental, moral and physical development of its members. The program focuses on character building, leadership and promotes a healthy, drug-free lifestyle. Sheriff’s Office personnel, instructors and senior staff act as positive role models, instilling in its members ideals of honesty, fairness, courage, respect, loyalty, dependability, attention to duty, love of god, family and fidelity to our country and its institutions. For more information about the Young Marines Program, please call our Juvenile Office, Detective Dennis Braziel at 985.902.2045 or 985.902.2011. 1. To promote the mental, moral, and physical development of its members. 2. To instill in its members the ideals of honesty, fairness, courage, respect, loyalty, dependability, attention to duty, love of God, and fidelity to our country and its institutions. 3. To stimulate an interest in, and respect for, academic achievement and the history and traditions of the United States of America. 4. To promote physical fitness through the conduct of physical activities, including participation in athletic events and close order drill. 5. To advocate a drug-free lifestyle through a continual drug prevention education program. On Saturday August 22, 2008 the members of the TPSO Young Marines Program assembled for their monthly training at Amite High School. The Young Marine program was adopted by the TPSO to focus on the well-being of the youth in our community. Detective Nick Vinterella along with his two instructors, Carl Foster and Marvin Vernon are committed to leading and teaching our Young Marines in ways of, leadership, team work, conflict resolution, the importance of community involvement and primarily, to adopt the attitude of “anything is possible”. During the August 22nd training, our Young Marines focused on their marksmanship skills (by use of an air rifle), marching drills and physical training. Sheriff Daniel Edwards has a belief that incorporating physical exercise into the daily lives of our youth will aid in a healthier and more confident individual. Each training agenda designed by the TPSO is equipped with the tools needed to strengthen the life skills of our young adults. Participating in this program can pave the way for our youth to seize opportunities as they present themselves and learn how to have the courage to step up and meet challenges head on. Sheriff Daniel Edwards is asking any parent who may be interested in learning more about the Young Marines Program to contact Detective Nick Vinterella at the Tangipahoa Parish Sheriff’s Office, 985.902.2046.